What if, instead of frantically trying to find a power outlet when your smartphone is about to die, you simply had to hold it in your hand and scroll through Instagram for a while? That’s the future the Matrix PowerWatch teases, because it’s able to charge itself using nothing but the warmth of your body. Unfortunately there’s a bit of a trade off I’ve noticed in my limited use, and infinite power comes with the need for some exceptional vision. The idea of harnessing the excess heat your body generates to power gadgets sounds like science fiction (there’s a good reason the smartwatch’s creators called their company Matrix Industries) and after first writing about the wearable a year ago, our readers were quick to cry “snake oil” in the comments. That’s because, while the science of converting heat into usable electricity using temperature differences (called the thermoelectric effect) has been around for almost 200 years, it requires extreme temperatures to actually work. BioLite’s CampStove, for example, can charge your smartphone while you’re out in the middle of the woods, but you’ll need to maintain a hot, roaring fire for a reliable trickle of power. The PowerWatch power itself using nothing but your body heat by opting for components that use less power and a design that maximizes thermodynamics. Remarkably the approach works, but a few of the workarounds (like that display) leave the smartwatch feeling less than smart. One of the biggest disappointments of the PowerWatch is its monochrome display that lacks a backlight and can be hard to actually see. There’s no touchscreen either, which means you’ll have to navigate the PowerWatch’s various modes using a pair of buttons on the right side, and a crown that serves as a rotating dial. Billed as a smartwatch, in addition to basic digital watch features like an alarm clock, stopwatch, and timer, the PowerWatch also uses an accelerometer to track your movements, and your quality of sleep overnight, which can be synced to an app over Bluetooth—a feature I was not able to test with the demo model I was sent. No touchscreens here, navigating the PowerWatch’s various modes is handled by two buttons and a crown dial. As a result, fitness tracker might be a more apt description for the PowerWatch, which is actually something it’s very good at because it’s constantly keeping tabs on your skin temperature. 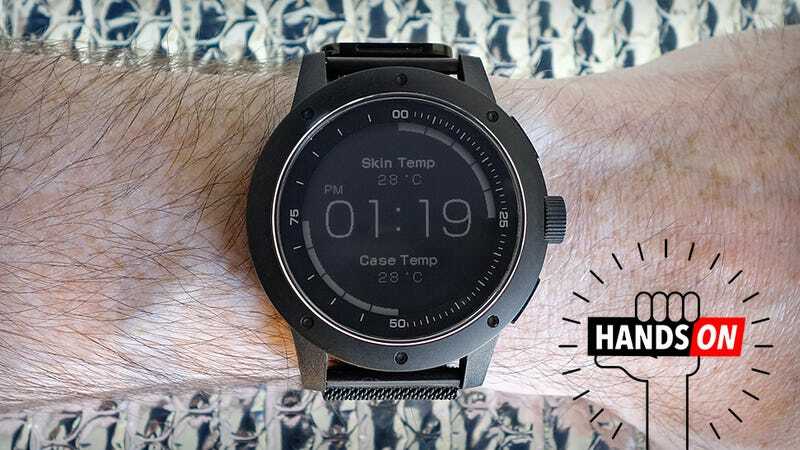 The PowerWatch’s creators claim it’s able to provide a far more accurate estimation of the calories you burn throughout the day using motion data and the fluctuating temperature of your body. Unfortunately, without access to the accompanying app to accurately set my body metrics, I didn’t have a chance to thoroughly test this during my time with the PowerWatch. What I could examine was the build of this device, and it has a heft and sturdy design! The entire housing is made from aluminum which feels wonderfully solid (and is necessary for the thermoelectric wizardry). You’ll also notice a series of grills on the top and bottom of the wearable. They look decorative, but actually act as heatsinks to help keep the watch’s case at a cooler temperature than the underside that’s constantly touching your skin. What looks like decorative grills on the PowerWatch are actually working heatsinks that help to keep the case cool while you wear it. The thermoelectric effect relies on a temperature difference between two conductors. Heat will naturally flow from a warm conductor towards a cold one, and in the process that causes electrons to flow which generates electricity. That’s a very basic breakdown of the science behind the PowerWatch, but thanks to an improved ‘boost converter chip’ that Boukai and Tham developed, the tiny amount of electricity converted from your body heat can be boosted so that there’s enough voltage to power circuits and chips. The PowerWatch does feature a built-in backup battery that will keep it running for up to a year without any outside power, and low-power modes that automatically kick in so that the wearable sips power. Yet I never had issues producing enough heat to keep the battery charged. I tested it mostly in a heated room and found the temperature difference never climbed higher than a single degree, going out for a walk in sub-zero temperatures did cool the case down by a few more degrees, and that was all—more than enough to keep the watch charged. The PowerWatch is only slightly larger than the Apple Watch, and feels satisfying solid with its all-metal case. Despite its hefty, all-metal design, the PowerWatch also doesn’t feel like a monstrosity on your wrist. It’s footprint is only slightly larger than the 42-millimeter Apple Watch, and only slightly thicker. I’ve certainly strapped on watches designed for extreme outdoor activities that were much larger than the PowerWatch. I had the chance to use the $229 black version of the PowerWatch (a cheaper $199 silver model is also available) which included a matching magnetic Milanese band that made it very easy to snugly strap it to my wrist. The better the fit, the better it should be able to harness your body heat. Aesthetically, the PowerWatch is definitely something I’d wear on a daily basis, even as a formal timepiece (the lack of an analog watch face doesn’t bother me), but I can see how it might look a little bulky on smaller wrists. The Milanese strap we tested is similar to the one available for the Apple Watch, using a magnetic clasp so it’s infinitely adjustable. After spending a couple of days with the Matrix PowerWatch, I can’t help but think of it as an odd technological chimera. As a smartwatch, it offers extremely basic ‘smart’ functionality which makes its starting price of $199 difficult to stomach, even with the promise of highly accurate calorie-tracking capabilities. But at the same time, battery life and charging is always the biggest downside of other smartwatches, and gadgets in general, and the PowerWatch miraculously never needs to be plugged in or plopped on a special pad every night. It will continue working until the day you die and your body stops generating heat, and that is awesome, if a little creepy. It will unfortunately be quite some time before other gadgets, like smartphones, are able to leech sufficient power from our bodies to keep running indefinitely, but the PowerWatch is a proof-of-concept for some exciting underlying technology that could genuinely deliver a better tomorrow—or at least one with fewer charging cables. Update, 3:47 p.m. EST/EDT: The makers of the PowerWatch reached out to us to clarify that the watch does have a two-second backlight that can be activated by holding down the ‘Mode’ button, which should help make it more visible when quickly checking the time in low-light conditions. The Matrix PowerWatch is an exciting gadget because of all the technology you can’t see at work. In the market for a new smartwatch?